We have some open spots so I now signing up non members. 3 Spots are left (Gravitywell & d_rehmann is signed up) Post here and I will put you on the list. This ride is normally a members only event, a benefit of membership. The sign up thread is posted in "members only rides" forum right now. In two weeks I will open it up to non members if it doesnt fill up. I will be taking the first 10 rigs that sign up, members first. In two weeks I will add sign ups on this thread to fill out any remaining open slots. Sign up now to have the best chance at getting an open slot. DST Lvl 1 is for new drivers with limited experience such as Flag Pole or who have only limited rock experience on green and blue trails The trails selected are challenging for drivers of limited experience. Stock JKR/JKUR on 35 or less (leave lockers off), Stock JK/JKU (open-open) on 35 or less and TJ/XJ/MJ (open-open) on 31 are perfect for this ride. Factory or aftermarket armor and skids are always nice but you dont need it for this ride. You will be challenged, there are consequences for stupidity but we have chosen trails that are perfectly passable on a stock TJ with moderate spotting. My daughters stock 4cyl stick shift TJ on 31's danced beautifully on these trails with me driving and Safari giving me the occasional spot. You will get a LOT of personal spotting attention and guidance on how to spot others during this event. By the time you are done you too will be able spot rigs through a rock garden and pick your own lines. If you are running high blues and blacks or have a built rig, 35"+ tires, lots of armor and fancy yourself a rock crawler THIS EVENT IS NOT FOR YOU. Driver Spotter Training (DST) and a guided rides the following day. March 30 for DST. March 31 for guided rides. Be at the sign in cabin on Saturday 0800 to sign in. 0830 is staging. Tow strap and shackles to hook it up. A full tank of gas when you leave Winchester. Normal Cove Fees Apply for Camping and Land Use. If you are running high blues and blacks or have a built rig, 3 or more inches of lift, 35"+ tires, lots of armor or fancy yourself a rock crawler THIS EVENT IS NOT FOR YOU. We will do a vehicle by vehicle walk through. I will go around and get under each vehicle with the driver and point out its low and "tender" spots. As a group we will discuss lockers, lines and how lines will differ for each vehicle. We will go over spotting hand signals. We will discuss braking, clutch and throttle techniques along with line selection fundamentals. When we get to the first rock garden the group will get out, walk along and ask questions as the first rig is spotted up through the rocks about 150 feet. The next rig will be moved up with everyone walking along until all rigs are across the full length (about 300 yards) of the rock garden. I will spot each rig over each obstacle and discuss what I am doing and why. Each rig and each driver is different and to be a good spotter you have to under stand both the rig AND the driver. At the end of the rock garden we will reverse course and the first two rigs in line will assist each other back across it. #2 driver spotting #1 rig, #1 driver spotting the #2 rig. Same for 3&4, 5&6, etc.. I will walk the line and assist as needed. We will then proceed to the second rock garden where driver pairs will assist each across. After this we will cross the park from south to west building you driving and spotting skills as we go. We will get off the trail around 4 pm. If you have selectable lockers you wont be using them, you will learn more open open. Being disconnected is helpful but not required. The event is designed for fairly new drivers and smaller less built or stock rigs. 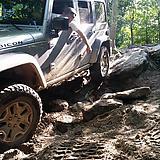 A new driver in a 31's shod TJ, a stock JK/JKU or Cherokee Trail Hawk will get a lot out of it. Its hard to "feel" the trail, sense the cut of the rocks or learn the importance to correct tire placement on rocks of this size when your on "big meats" and I dont intend to run stuff so big that a rig on 31's is going to have trouble. If your on tires bigger than 35 inch please dont sign up. I intend for rigs to get "lightly" stuck from time to time. You learn by making GENTLE mistakes. Slow, gentle and patient is graciously rewarded. Pin-it to Win-it looses when your in the rocks. As I said earlier, if you rig is built up we have an event planned for you later in the summer. We will be eating lunch on the trail. Bring food. Bring Water. Re: Driver Spotter Training Level 1: Non Member Standby List Sign Up. I have a 2018 JK Willys. 2" Spacer lift, oil/transmission skid, and rock sliders. I'm still on factory tires. Your rig is perfect for the DST. The small lift and factory tires will let you get the most from this. More feel of the rocks with the smaller tires and just a little lift to add a touch of clearance. The skids are nice and we might put them to a bit of light (very light if you drive smart) use Saturday afternoon. Right now we have about half of the positions filled so I am pretty confident we will have room. I would be interested in attending. I have a 6 speed JL Rubicon but, I haven't captained a manual rig off-road before. I don't want to wait to get to Flagpole or Raush to learn if I don't have to. Have fun! Wish I could attend! Re: Re: Driver Spotter Training Level 1: Non Member Standby List Sign Up. Excellent! I missed RC this weekend, looking forward to this. I love teaching stick. Its fun and once you figure it out your going to love it. Much smoother than auto trans work. Takes a bit more planning and skill but a better ride. We will meet at 0900 at campsite where I will be. This will be Camp IV. Right turn after the sign in cabin, right turn after the big storage sheds and then the next left. The folks at the sign in cabin can show you a map. Its a two hour driver from the Beltway so plan accordingly. Look for the Big Red XJ with the Exo Cage. DONT BE LATE. We have a lot to go over before getting on the trail. If you hit the sign in cabin at 0800-0830 you will be fine. We will start with a vehicle walk through, learning who has what gears, transmission, armor, skids and tires. We will discuss each vehicles weaknesses and strengths. After that we will discuss spotting signals and driving skills. I hope to hit the trail around 10. Pack you lunch. We will likely eat on the trail so we can have a full day of wheeling. I wish you could too. How the H3LL have you been? Long time no hear. Need to fly into Boston to see if you turned that place around yet. We need a "Crozet" Weekend and get the gang back together. Here are my photos and videos from our adventures. If anyone else has videos or photos, you can add them to the album. Feel Free to add to this album.